Details of services and other church organised events can be found at http://www.oofgchurch.org.uk. General parish information can be gleaned from the Parish Magazine, (current copy usually available just inside the church) representing the joined parishes of Ockley, Okewood Hill and Forest Green. 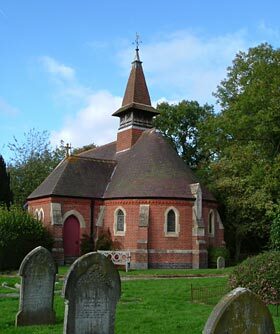 This Church was built by Charles and Christina Hensley of Pratsham Grange, Tanhurst Lane as a lasting memorial to the eldest son, Everard, who was fatally shot by his cousin while rabbit shooting in 1892. Everard Hensley had been born on Trinity Sunday 1874, hence the reason for the dedication of the church to the Holy Trinity. It is a small building built of local Surrey brick, and capable of seating 90, the interior is simple and completely lacking fuss. Colour is introduced by the stained glass in the five East windows, all of which are dedicated to the Hensleys or their cousins the Burneys. On the extreme right are the windows for Ernest Charles Everard Hensley, 1874-1892, depicting a youthful face. In the belfry are two manually operated bells.